A ‘Creator in Residence’ is someone who is exploring their own creative unfoldment, no talent or experience is required. We offer a nurturing space with loving support so you can take the time to delve into your inner world and bring forth your own unique creative expression. Whether you are an emerging artist or an adventurous spirit, this is a wonderful opportunity to spread your wings and fly! 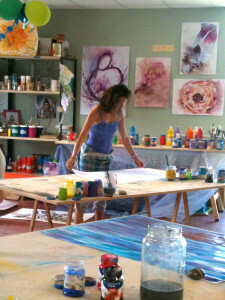 Each Creator in Residence Program is a unique flow co-created by the participants. The flow will include morning circles for inspiration and guidance, studio time (often silent, sometimes with music), occasional nights out for pizza in Assisi, excursions to the sacred sites of St. Francis and the artistic treasures of Italy. Meals together are spiced with lively conversations; and there is also ample time for replenishing alone time- walks in nature, early morning meditations, etc. Precious time dedicated to delving deeply into our own inner process balances with sharing, laughter and fun. Tuition covers your use of the studio and basic materials, guided catalyzing processes and a light structure that affords loving support of your process. Our residency program provides a unique opportunity in an uplifting environment. The Academy of Art, Creativity and Consciousness is located in the heart of Umbria, near Assisi- the international city of peace and home of St. Francis of Assisi. We are also across the street from one of Europe’s most popular yoga and meditation retreat centers- Ananda. We offer a place for artists to ‘go to the mountain top’- to seek the highest font of Being as the source of their inspiration. In this environment of beauty and spirituality, the heart and mind can open and expand. Tuition covers your use of the studio including the kitchen and office, free internet access and use of common tools such as paint brushes, staplers, scissors, wire cutters, hammers, drills & other building tools, glue, wire, string, as well as some basic supplementary art supplies such as student grade colored pencils, chalk & oil pastels. Artists will be responsible for their own art supplies such as canvas, paint, etc. We can assist you in purchasing your supplies in Italy. For those staying one month or more, we have made special arrangements at ‘Arcobelano’ (‘rainbow’), a guesthouse next door to the academy, for a limited number of rooms at a special price. Each room includes a bathroom en suite. Meals are not included, but you can use the kitchen at the Academy. Daily yoga & meditation are available through the Ananda Center. Please contact them directly for details as to schedules and costs. * Arte Spirito is open to all paths and honors all spiritual traditions. We are adjacent to the international yoga and mediation center of Ananda (Ananda is based on the path of Raja Yoga and the teachings of Paramhansa Yogananda) Participants may choose their level of involvement with the Ananda community.